The annual Blackkettle adult snooker tournament finished yesterday evening. The final was contested by Barry ‘The Potter’ Cotter and Hugh ‘The Cue’ Magoo and the scores were tied going into the last frame. 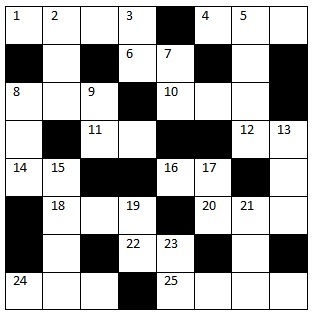 This puzzle allows solvers to discover the winner and score in that final frame which was decided on the black. The winner and score in the final frame should be written below the grid. No entry starts with zero and all are distinct. 1 The time the frame began in the 24 hr clock, a triangular number. 4 The number of spectators who watched the frame, a triangular number that’s not a multiple of 14ac. 6 The number of spectators who fell asleep during the frame, the highest common factor of 1ac and 25ac. 8 The square of Barry’s age in years. 10 A multiple of Hugh’s score in the frame. 11 One player’s final score. 12 The number of frames played in the match. 14 The number of years the tournament has been running, a prime factor of 15dn. 16 One player’s final score. 18 The square of Hugh’s age in years, it shares a factor with 15dn. 20 The number of souvenir programmes sold, a multiple of 23dn. 22 The highest break in the frame, a triangular number. 24 The size of the obtuse angle made by the cue ball, object ball and pocket for the winning shot, a triangular number. 2 The number of sweets eaten by the spectators during the frame, a multiple of 22ac. 3 The number of lights illuminating the table, a factor of 8ac. 5 The product of both players’ scores. 7 The number of BBC employees covering the match. Now you know why the licence fee is so high! It is 9dn – 17dn. 8 The number of spectators who were listening to the commentary, a multiple of 9dn. 9 The amount, in fluid ounces, of Peemore mineral water consumed during the match, a triangular number. Other brands of mineral water are available. 13 The number of female spectators who watched the frame, a triangular number and multiple of 6ac. 15 The winner’s prize money in pounds, a triangular number. 17 The referee’s age in years, a factor of 25ac. 19 The length of Barry’s cue in inches, a multiple of 12ac. 21 The number of women over 60 who watched the frame, a triangular number. 23 The cost of the souvenir programme in pounds, a factor of 8ac. To enter this competition, send your entry as an image or in list format, to ccpuzzles@talktalk.net before the 8th May 2015. The first correct entry drawn from the hat will receive a book donated by The Crossword Centre. Please note the new email address.